When it comes to reviews and products, makeup, I know! I won’t give that up. That being said, I am no perfume expert. So this review is based solely on my views of these two new fragrances launched here in Malaysia by perhaps one of the most well known brand dedicated to all things woman; AVON!!! Avon is not only huge in Malaysia but they have also been in the business for quite a while. They may not have so much online presence (which may make them not so often discussed and reviewed on social media) but they do put out some pretty amazing products. So I got this PR package from Avon Malaysia and boy was I excited! Disclaimer; although these were sent to me, opinions are my own. YES! I LOVE this PR package! Description on the back of the Homme EDT box. Description on the Femme EDP box. Let me talk about the Homme EDT first because I did give that a fair run. Let me be honest, when I initially sprayed it, there was something I didn’t really like about how the citrus component and woody component mixed together. But when it sits on the skin after a couple of minutes, the citrus mellows down and then, it smells amazing! Fragrances do that sometimes. A very macho, manly kind of a fragrance this one. I put it a couple of times to test out its longevity. On an active day when I heavily perspired, right around the 4 hour mark it started fading and at about 6 to 8 hours it ran its course. But with indoor leisure activity, I got about 6 to 8 hours of good dissipation and then it started to fade. However, even towards the end of the day, I could still detect the scent albeit faintly. The Femme EDP on the other hand was lovely right from the first spritz! The jasmine is perfectly proportioned to not be overpowering but still allowing its magic to come trough. Very sophisticated yet not stuffy. Two thumbs up. Can’t really tell in terms of longevity (because I didn’t want to be wearing it out and people asking me why I smell cute) but since it is an EDP it would perhaps last quite long. These retail for MYR 89.00 (West Malaysia) and MYR 102.40 (East Malaysia), each but if you purchase any two of them the price is MYR 159.00 (West Malaysia) and MYR 182.90 (East Malaysia). I’ve linked below, all of Avon Malaysia’s information so you can check them out! Again, thank you Avon Malaysia! Avon is one of those companies which everyone in Malaysia, who use any kind of makeup, know. The company has been a long standing fixture in the beauty industry, founded over a century ago when door-to-door salesman David H. McConnell decided to sell perfumes under the name California Perfume Company. Good trivia huh. 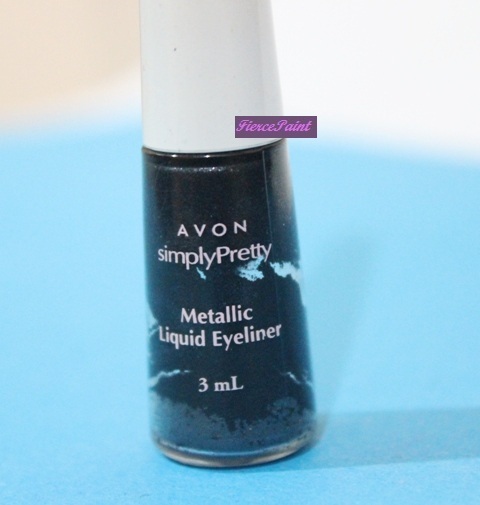 Moving on, this review is about the Metallic Liquid Eyeliner which is part of the Avon, Simply Pretty line. Label on the bottle. Product amount (3 ml) is clearly stated here. Description on the other side of the bottle. Pretty obvious that the bottle is empty. It’s a clear bottle and so it is obvious when product runs out. The applicator is a felt tip one. 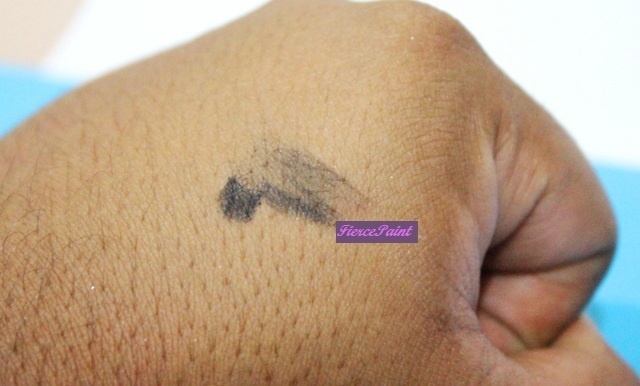 Description: It is a liquid eyeliner with a felt tip applicator. 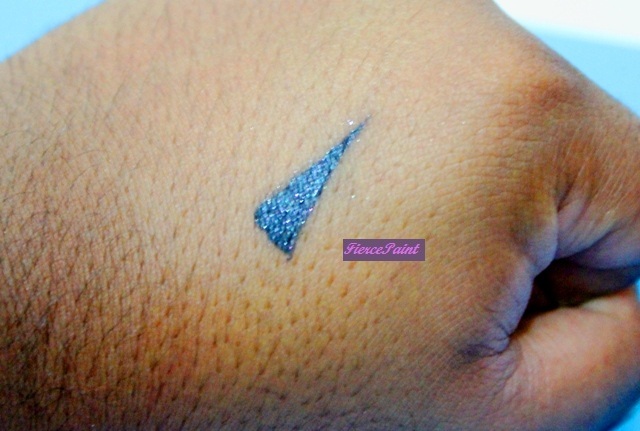 The liquid product itself dries down to a matte finish, however, the words ‘metallic’ and the word ‘shiny’ comes from specks of glitter present in the liner. There is only one shade available and that is the shade ‘shiny black’. It is not waterproof and does not claim to be. Price: MYR 15.90 however, Avon always has promotions and so the price could come down until MYR 10 per bottle. Where to buy: Avon boutiques or distributors. Although not apparent, the thin line is not very precise and it skips because the felt tip is not very sharp. 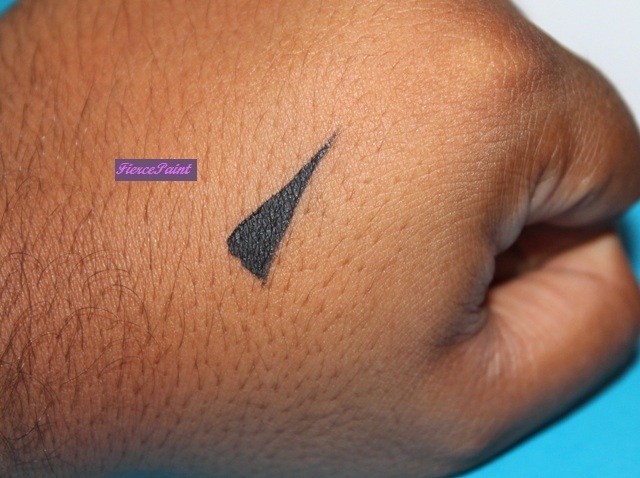 There are a few things I would like to share about this eyeliner that I have personally experienced. 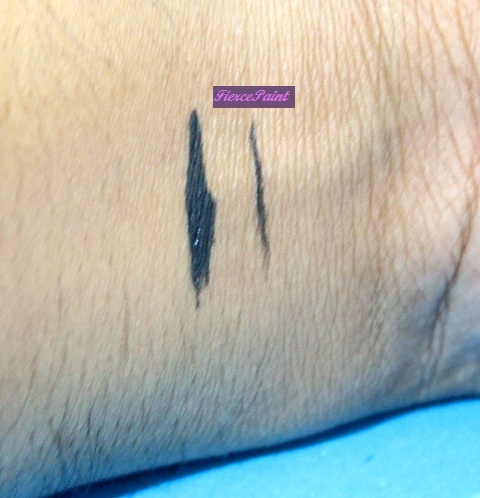 The metallic and shiny attributes of the liner does not show unless pat down a little bit. The pictures below will show you what I mean. 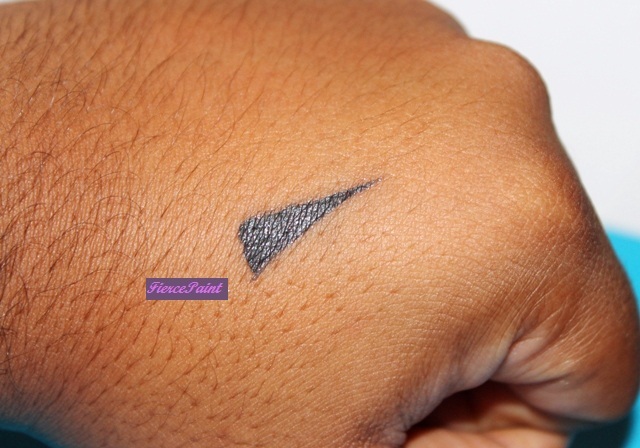 As you can see the liner appears completely matte. Now see what happens when I lightly pat it with my ring finger. A few pats and boom, it is shiny!!! 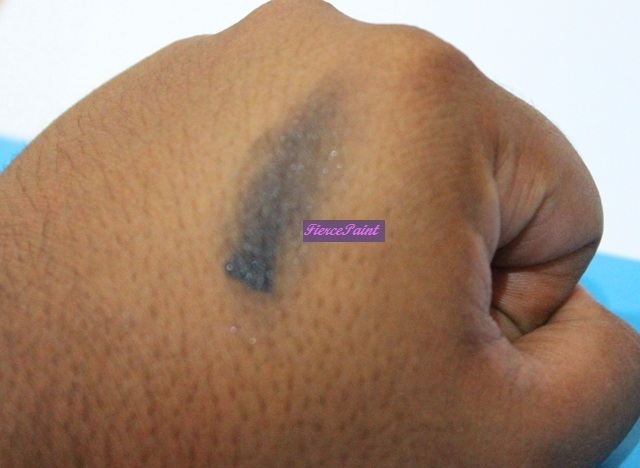 Two other things that one should know about this liner is, since it is not waterproof it smudges both with water and oil as you will see below. Rubbed with a slightly damp finger (with water ok!!! Not saliva!!! 😛 ). 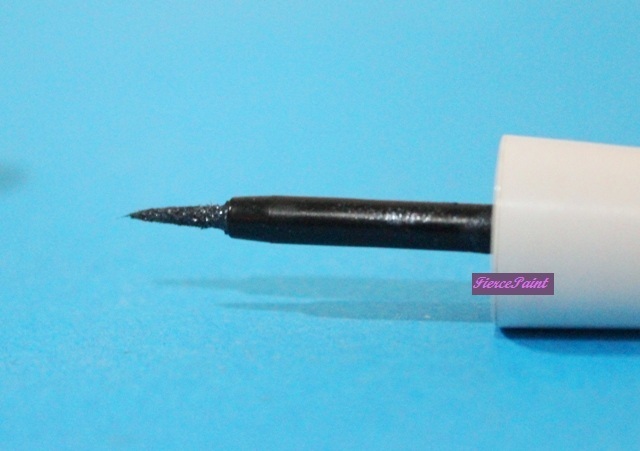 It is a deep coal black liquid eyeliner that is very opaque. The metallic shine is gorgeous on the eyes. Although it is not waterproof it smudges easily because if one has even slightly oily lids or even the slightest dampness around the eyes, the liner would smudge and run. I remember the first time I used it for one of my performances, looking at myself in the dressing room mirror after the performance, I had a black streak of liner all the way from my eyes to my chin. A streak of sweat from my forehead had melted the eyeliner! The felt tip is not fine and thus it is difficult to deal with. Not beginner friendly. It does not dry quickly. I don’t have sensitive eyes, however, every time I did use this liner my eyes would be slightly irritated and tear up upon initial application. 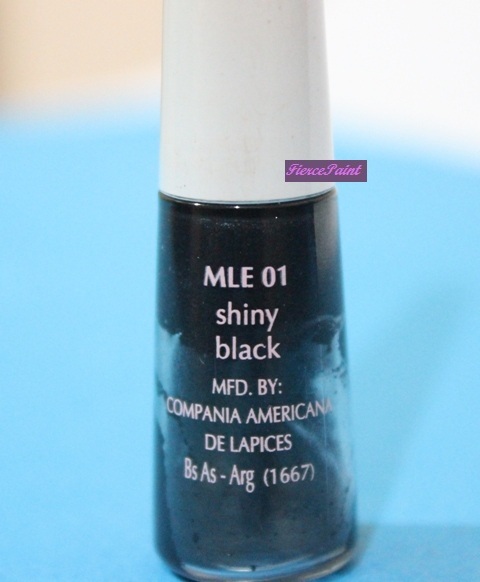 I really did not enjoy this liner, however, if you do not have oily eyelids and would not be sweating or crying (or if your sweat does not run near your eyeliner) then this is a very pretty liquid eyeliner with a sparkly metallic finish.